With this receiver and a long wire antenna, I learned there was quite an exciting world of foreign broadcast. I have been a ham since I was 16 years old. My first station was like many in the mid-sixties; a Hammarlund HQ-110C and a Heathkit DX-60B. As a novice licensee, the transmitter was crystal controlled; a requirement for novices back then. When I got my General license I added a Knight VFO to the transmitter. This was my only station until I graduated college and served in the Army. While stationed at Ft. Huachuca I upgraded to a Yaesu FT-101B. This remained my primary rig until just recently. While at Ft. Huachuca I experimented with many different antennas. I left the service and lived in Dallas TX. for several years. It was at this time that I really had a “shack”. At this location I operated from a separate building in the backyard and setup a 70 ft tower with Mosley TA-33jr. With a change in employment and a growing family I left Dallas and entered a long period of very limited ham activity. The recent growth in PSK31 along with becoming an “empty nester” has prompted my renewed interest in hamming. While living in Exton, PA my station was in an antenna restricted townhouse community. Thus, it took some creativity to become an active ham again. While I wasn’t be able to compete with “big guns” of 700 watts driving a 75 ft tribander, with some research and creativity a townhouse can accommodate ham activities. I have provided several pages on this site to document my experiences and alternatives for indoor attic antennas in an antenna-restricted community. Moving permanently to Aiken, SC has once again provided an opportunity for outdoor antennas. Below you see my current station and hex beam antenna. The station consists of a Flex Radio 6500 transceiver (on far right) and an Elecraft KPA-500 linear amplifier (right) with Elecraft KAT-500 autotuner. I have retired (& sold) my Kenwood TS-570D transceiver. The amplifier is a no-tune solid state unit providing 500 watts on all bands, 160m thru 6m. 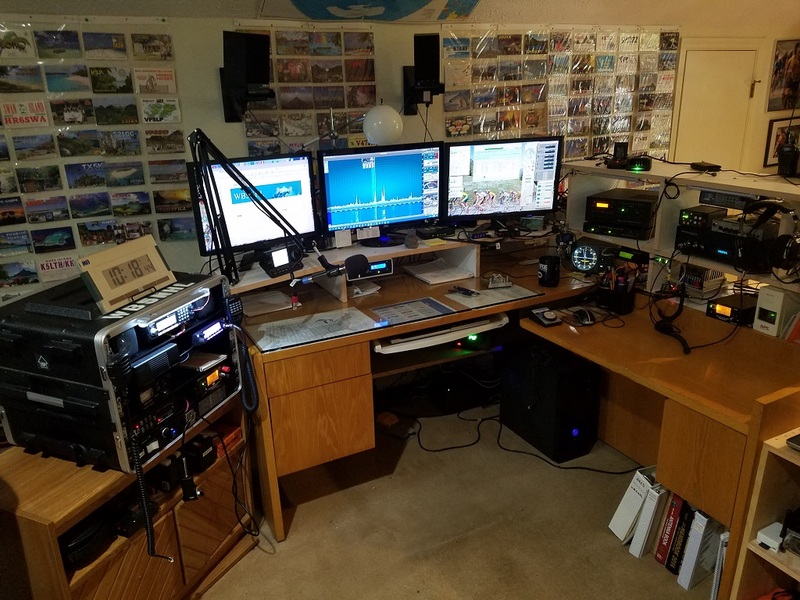 On the far left is my GoBox (in use everyday) that includes an Icom IC-7100 for HF and DSTAR, an Alinco DR-635T VHF/UHF transceiver and a Uniden BCD536HP scanner. My antennas consist of a K4KIO hex beam at 30 ft for 20-6 meters. With large trees on my suburban lot I now have good supports for a wire antenna. I use an all band off-center fed dipole for 30, 40 and 80 meters. The coax feed is routed through the attic. For operations on 160 meter top band I use an inverted-L at 50ft with a K2AV folded counterpoise. In early 2014 I started investigating ways of improving my low band receive capability on a 1/2 acre house lot. I looked carefully at a K9AV loop but finally decided on a Shared Apex Loop (SAL-20) in the corner of the lot. Though expensive, this antenna is an absolute wonder and highly recommend for low noise receiving on 160, 80 & 40 meter bands. I recently have gotten interested in DSTAR operation. For mobile operation I use an ICOM ID-5100 dualband transceiver. In the shack I have a ICOM IC-7100 HF/VHF/UHF transceiver in the GoBox. Portable operation is via an ICOM ID-51 HT. I am a backup administrator for the Aiken DSTAR repeater, KR4AIK. I also have a Raspberry Pi operating (headless) as an APRS digipeater using my old ICOM IC-2100H 2 meter transceiver. A second Raspberry Pi operates as a DSTAR Access Point with a DVMega daughter board. Operation is at 441.350 Mhz. My DXCC record (current) is 310 countries confirmed (mixed). 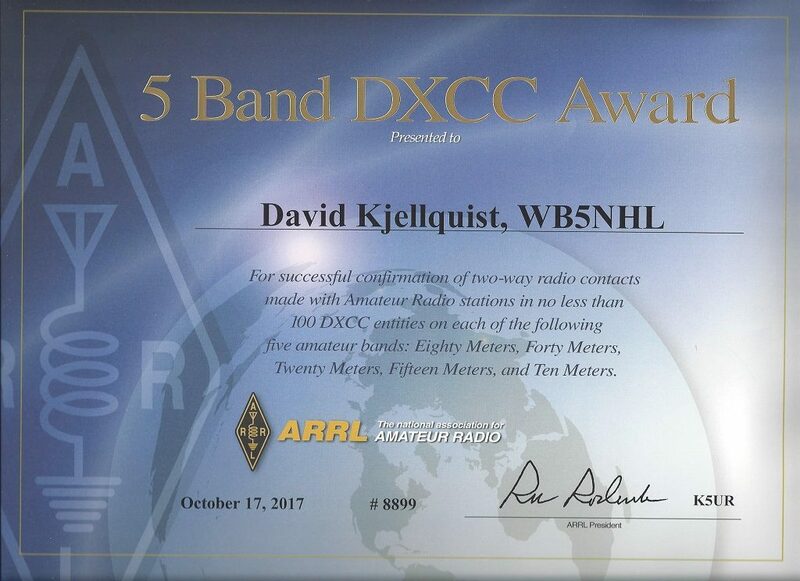 I have 5BDXCC #8899. I have 244 countries confirmed (DXCC #3,210) in digital modes. On 160M, I have 46 states, and 37 countries confirmed.